Pandy Isaf07500208597work Guest AccommodationIn a tranquil and peaceful riverside setting, Pandy Isaf, reputably in part dating back some 400 years, is situated within the Snowdonia National Park beneath the towering Cader Idris mountain range and yet only two miles from the centre of Dolgellau. The newly built extension to the cottage is solely for the use of our guests and comprises two double en-suite bedrooms and one luxury suite with its own private sitting room. The main sitting room and dining room have the benefit of a double sided wood burning stove and access to terraces overlooking the lawned gardens and the river. Guests are offered every luxury and dinner is available when pre-booked. 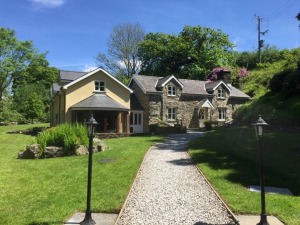 In a tranquil and peaceful riverside setting, Pandy Isaf, reputably in part dating back some 400 years, is situated within the Snowdonia National Park beneath the towering Cader Idris mountain range and yet only two miles from the centre of Dolgellau. Leisure Centre at Dolgellau - 2 miles Children welcome from age 10. From the south via Builth Wells and Machynlleth A470. At the bottom of the hill leading onto the Dolgellau bypass (A470) turn into the lane at the end of the Esso Garage forecourt and proceed 6/10th mile down the lane. Turn left by the high stone wall and over the cattle grid. A further 1/10th mile and Pandy Isaf is on the right. From the car park there is one step up onto a gravel path some 15 metres long. There are 3 deep steps down onto the terrace and a further two steps up to the front door. The car park, steps and terrace are illuminated at night. Inside the house the hall and dining room are on the same level with a 6in step down into the sitting room. There is one step down onto the terrace from both the dining room and sitting room The two double bedrooms on the first floor are accessed via on open tread staircase with a handrail on either side. The suite has a bedroom and bathroom on the ground floor with a sitting room accessed by a conventional staircase on the first floor.